THE CORPUS CHRISTI SHIP CHANNEL IMPROVEMENT PROJECT: Allows safe passage of deep draft vessels. Resurgence of US energy sector is driving the growth at the Port of Corpus Christi. The Port of Corpus Christi–already the No. 1 exporter of U.S. crude oil in the nation–is about to embark on a channel improvement project that will further boost the resurgence of the American energy sector. The Port of Corpus Christi Authority Commission and the U.S. Army Corps of Engineers in September executed a project partnership agreement for the deepening and widening of the Corpus Christi Ship Channel. The CC Ship Channel Improvement Project will widen the CC Ship Channel to 530 feet and create additional barge shelves, which will enable two-way vessel and barge traffic. The project will also deepen the CC Ship Channel to 54 feet MLLW (Mean Lower Low Water) to allow for safe passage of deep draft vessels. These improvements will significantly benefit the country’s energy sector, says Sean Strawbridge, deputy executive director and chief operating officer. To place crude or natural gas in foreign markets, it has to be done competitively, with larger ships that can transport “more molecules,” he says. Port commissioners also approved the acceleration of $32 million in port funds to the Corps to expedite the initial construction phase of the project, which will deepen of the channel from the Gulf of Mexico to Harbor Island. Congress, under the Water Resources Development Act of 2007, initially authorized the entire project. Congress re-authorized it when that law was revisited in 2014 and reaffirmed its commitment to the project under the 2016 Water Infrastructure Improvements for the Nation Act. With the Corps’ proportionate cost-share projected to be $225 million and the port’s proportionate cost-share projected at $102 million, the entire project is estimated to cost $327 million. The PPA allows the PCCA to accelerate its portion of the project cost-share, thereby allowing construction to commence ahead of federal appropriations up to $102 million. The Port of Corpus Christi is “at the forefront of the energy resurgence,” says Strawbridge, citing its proximity to the Eagle Ford Shale, which extends deep into Mexico, and the Permian Basin, the nation’s largest crude oil producing region. 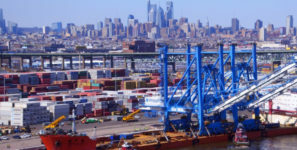 That dominance is especially evident now with the port’s ability to deepen and widen the ship channel as well as build wider berths and a higher bridge, including the new $1 billion Harbor Bridge Project. “That’s why we’re seeing $50 billion in private investments in and around Corpus Christi’s ship channels–which just solidifies the energy dominance of the U.S. energy sector,” Strawbridge says.